1. Hot airflow dryer using high speed flow steam to make wet materials suspend in it, in the process of the air flow (the time is instant, nearly 10~15s), the wet materials will be dried. Then the dried material will be outputted from the cyclone, used hot airflow and steam will be exhausted from the top of cyclone. Due to the high speed of hot airflow, the materials dispersing fully in the chambers, so nearly all of the materials surface can be dried. It means the larger heat transfer surface. Instant drying time airflow speed is very fast, drive the materials to output in an instant, only 10~15 seconds. So it won’t influence the quality of thermosensitive materials or low-melting-point materials. 3. Easy operation of instruction, Less area occupied, Low investment and maintenance cost. Rice hull, wood sawdust, the small wood shavings, and grain material like crushed branch and wood chips. 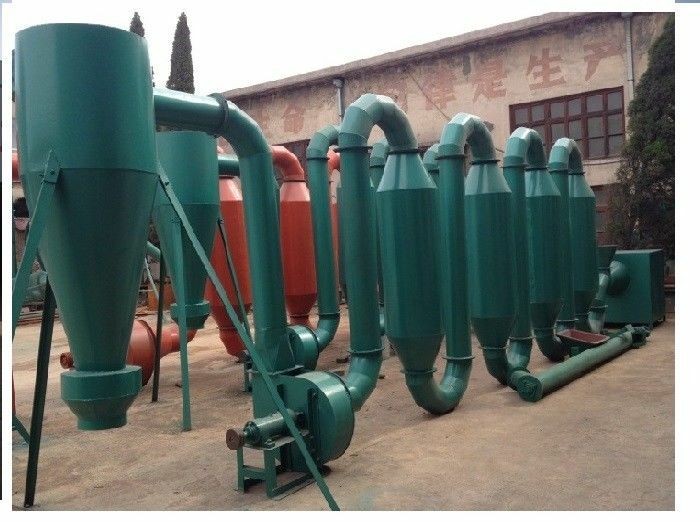 Under temperature of 180℃ hot airflow, the airflow dryers can dry the materials with 35% moisture content to 12% at one time!